Every year we get a good news story about the state of the market for Irish whiskey from Jameson's parent company, Pernod Ricard. Their annual reports have been boasting of an average annual growth in sales of almost 10%. That figure disguises the spectacular results achieved in some countries: 22% growth in volume in the US last year, for example. 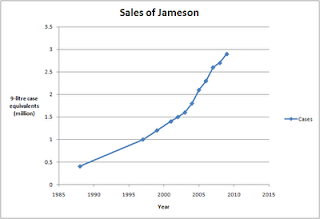 I've plotted the volume sales of Jameson in this chart since 1988, the year Pernod acquired Irish Distillers. These are the figures I had available from the various annual reports. The standard measure in the industry is the 9-litre case equivalent. Spirits are sold in several different bottle sizes but this measure imagines that all the produced volume has been shipped in cases of 9 litres total. That would be 12 bottles of 750ml each. In 1988 Irish Distillers was selling 0.4m cases a year. The latest financial report for the year up to the end of June 2010 claims a bit over 2.9m cases. I was at the Midleton distillery recently and heard the welcome, though inevitable, news that the 3m barrier has finally been breached. Myself and a few others were very kindly shown over the plant by David Quinn, Distillery Manager, and David Byrne, Export Development Manager. I doubt there was another place on this planet that I was more keen to explore but it's not usually open to visitors. You can imagine, then, that this was a particular treat for me. The guys were very open with the details of the remarkable operation down there in Cork so I learned a great deal, for which I am extremely grateful. But back to the Jameson story. Three million cases a year is impressive but Midleton has to anticipate sales years down the road to allow for maturation time. That's why the plant runs 24 hours a day, 7 days a week. They are laying down enough Jameson to sell 6m cases a year. And they won't be stopping there. In four years or so, they expect to expand the plant to double the distillation capacity. The numbers boggle the mind like an Irish bank bailout. They can distil 30m litres of pure alcohol in a year. This is filled into 100,000 casks. One warehouse can hold 35,000 casks and there are 36 warehouses on the site. Two or three warehouses are added every year (they have recently acquired some adjacent land so they can maintain this pace of expansion). Jameson is the flagship of Irish whiskey around the world. Where it goes, other Irish whiskeys can follow in its draft. 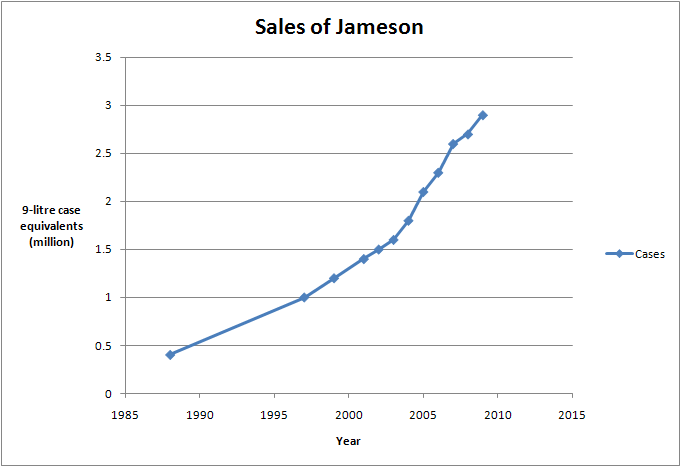 Clearly Jameson is going places fast, so this can only be a good thing for the industry as a whole.